Successfully Added Atlantis - 4GB Deluxe Waterproof MP3 Player for Swimming to your Shopping Cart. The Atlantis underwater MP3 player. Deluxe edition of our famous "Waterproof MP3 Player For Watersports And Shower Enthusiasts" we introduced to the world in 2008. Enjoy clear audio up to ten meters in depth while diving on your adventures under the sea, or when just chilling in your swimming pool. The Atlantis comes in a cylindrical compact form factor shape, allowing it to be easily carried with you on your underwater explorations. Whether you enjoy Rock, Hi Hop, Pop, or Classical music, you will thoroughly enjoy the clarity and quality of the music provided by this unit. The form-fitting hooked earphones come in black and yellow color, and are shaped to fit comfortably around your ear while the earbuds are placed securely in your ear. In addition, the ear buds are designed to also prevent water from entering your ear. For maximum convenience, when wearing goggles, you can simply attach the Atlantis orange straps securely to the goggle strap. 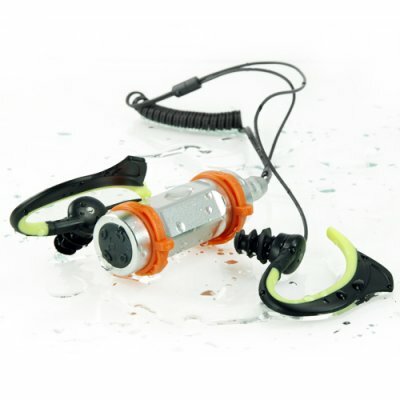 The Atlantis also contains waterproof in-ear earphones that utilize a screw-in jack design to ensure a water-tight connection, making this an amazingly convenient audio player for scuba divers and surfers. Get the Atlantis underwater MP3 player today and enjoy your diving adventure with a beat in ever wave. The CVEU-L04 (a.k.a Atlantis) is available in stock today for single and bulk purchases straight from the leaders in factory direct wholesale electronics, Chinavasion. No, this waterproof MP3 player, can be used in beaches, swimming pools, lakes river and pretty much anywhere you enjoy swimming or diving. Can I use this in my hot tub? It is recommended to use this in swimming pools, beaches, shore snorkling, etc. Extreme temperatures can negatively effect battery life. Ein Super Product! Eignet sich perfekt für Outdor Sport!